Art of Estates’ Appraisal Firm provides valuation services for a host of painting media forms, but the Appraisal field and art world both lack a clear definition of the term painting. Art news sources, including that of Art NEWS, have struggled to put a finger on exactly what the term painting really means. Largely, because of artists in the 20th Century, who were contemporary in their time, sought out to redefine, and bend the rules of established forms of creating works of art. For the sake of this website, we’ll define paintings as a unique, 1 of 1, work of art that was created by a wet media by hand (without a machine) and transferred to a ground. In other words, not mechanically or in a dry media (as a pastel, pencil or charcoal would be considered). Paintings by that description would include watercolor, oil, acrylic, and gouache. A simple example would be oil from a palette, transferred by hand with a brush to a canvas and finally dried for public purchase and acquisition. While other mediums may be added to these media forms to create a melding of the two, we’ll call those mixed media and include those in our Fine Art Appraisal page. When we appraise art, we collect as much information from our client (usually in the form of provenance), the painting we are inspecting onsite, the market, and from a valuable host of resources when we are performing a formal appraisal report for our clients. All of the information together, collectively as a whole, allows us to make a final conclusion on the value or cost, based on your reports definition in our report. All the information pertaining to value will be included in your appraisal report. Putting all this information together in an organized, professional, and archivable format allows family, future generations, or even a buying art collector to know about your artworks history by providing a visual and virtual snapshot in time of its value (great for estate planning) and condition (great for insurance purposes). Below, we’ll discuss some the more important art movements, regions and styles. Please note that transitionary periods or styles can be seen in many different levels (of notoriety) in the art world and even within artist’s body of work. Some artists were even early pioneers of a movement, but lacked fanfare, representation or exposure to the market at large, resulting in early failures and late success (Clyfford Still or Bob Ross) or quite the opposite (Wayne Willis or Frederic Shane). However, these concerns depend on a range of other factors of influence, including, but not limited to regional and stylistic trends and/or the economic period placement historically. In the end however, the market dictates the value of your painting(s), not personal opinions. Descending in time, we’ll talk about some of the more important art movements for painting, the artists who were pioneers or important of those, and when the art movements were most actively followed and produced. While the 20th Century has been the most eventful period yet to appear in the artworld, the 21st Century will likely be considered the same by the 22nd Century. While technology appears to be moving exponentially faster every year, so does the flow of information from one continent to the other and sub-culture to culture through social media, advanced travel options, and email. This movement of ideas, techniques, education, advances in compositions coupled with increased exposure will continue to foster creativity. Economic fluctuations that now included the Great Recession and political adjustments of the Middle East, including Europe and Great Britain’s Brexit process. 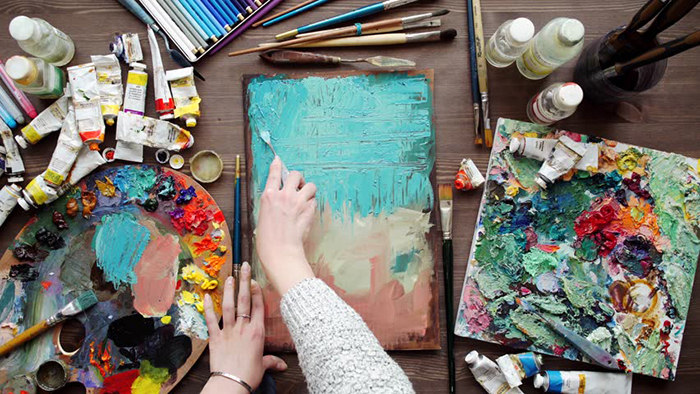 While traditional media in art is still strong with watercolor, oil, acrylic and gouache, techniques frequently being used in the contemporary art market now include video, 3D, virtual reality and a host of modern materials or minerals once thought has waste or unrecyclable entering the field as upcycled, repurposed as well as in the recycled form. While this may sound a bit like assemblage used by collage and folk artists, it has become more prevalent in the Fine Art world and has become more refined with more considerations to its conservation unlike previous generations. 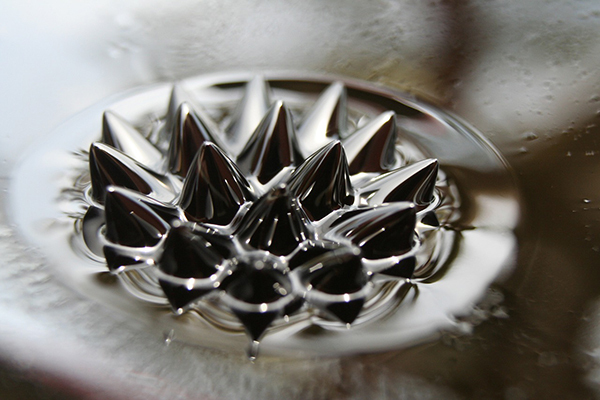 A photo below features Ferrofluid, a liquid that becomes magnetized in the presence of a magnetic field. Originally invented by NASA’s Steve Papell in1963 as a liquid rocket fuel is now used by a small number of artists, but most notably by Japanese artist Sachiko Kodam. Currently considered among art critics as the most eventful period in art history. The 20th Century art movements arose from worldwide scientific advancements, political upheavals, social changes, increased industrialization, formal education, trade partnerships, transportation developments, multiple world wars and civil wars resulting in new borders, economic fluctuations that included the Great Depression and ended with the dot-com boom. These elemental tides gave rise to the most influential modern and contemporary art movements and developments that include Neo Expressionism, Street Art, Photorealism, Minimalism, Op Art, Pop Art, Abstract Expressionism, Regionalism, Surrealism, Futurism, Dada, Cubism, Primitivism, and Fauvism. Neo Expressionism movement is a form of Postmodernism art born in Germany in the late 1970’s spreading to other parts of Europe and United States. Street art is a movement that sprung from the 1960’s from creating images in unsanctioned (illegal) public locations, executed outside of the context of traditional spaces. Also known as Urban Art, Guerrilla Art, and Graffiti using acrylic spray paint free-hand, stencils, wheat pastes, stickers, street installations, with physically intrusive sculptures, and visually intrusive videos and yarn-bombing. Also known as Hyperrealism and Superrealism, is defined as picture quality paintings that nearly trick the eye with images appearing to replicate the real world in photo detail. Period when art became a reaction to the busy compositions of Abstract Expressionism and was typically referred to as anything that is spare, basic or stripped to its essentials or lacking any elements whatsoever. A period when sharp geometric and architectural based illusions were created with flat surfaces and appear to move visually from different vantage points. Artistic period when images began depicting images of popular brands, culture, comics, advertising with hard edges using commercial processes like silk-screening. Abstract Expressionism signaled a new age of American artistic expression through spontaneity, monumental size, and individualism at the end of World War II. The art style, that excluded geometric shapes and realism, is broken into two categories of Gestural Abstraction (action painting), which emphasized the energy and Color-field Painting, which focused on the creation of vast, seemingly floating areas of color atop of one another. The rise of Abstract Expressionism has been attributed to the influence of European movements like Cubism and Surrealism, which reached New York in the 1930’s and 1940’s via museum exhibitions, academic institutions, and the stateside relocation of many major European artists due to World War II. A realist modern art movement that included paintings, murals, and illustrations depicting realistic scenes of rural and small-town America primarily in the Midwest and Deep South. In response to the Great Depression, the style reached its height of popularity from 1930 to 1935, as it was widely appreciated for its iconic and emblematic scenes from the American heartland and bible belt with subtle undertones of political and social change. The art was a relatively conservative and traditional. The movement started as a lyrical and highly abstract form that was referred to as Automatism, mostly strongly represented in works by Joan Miro. The second phase of this period was an Illusionary Surrealism phase of Salvador Dali that depicts the element of surprise within a dream like state with unexpected juxtapositions and suggestive analogies. An Italian born art movement using themes of the contemporary social issues of the time connecting the future. Subjects, themes and ideas were based on the increasing speed of technology, airplanes, automobiles, industrial revolution, youth, and violence. Compositions focued on the movement of the object within an artwork, manipulating and overlaying an image several times to understand the motion and movement it creates. A pre-war avant-garde inspiration for an international movement based on rejecting logic, reason and aesthetics of the capitalist society and its political rhetoric. The artists believed that government was heavily corrupt and was repressive of their social values. 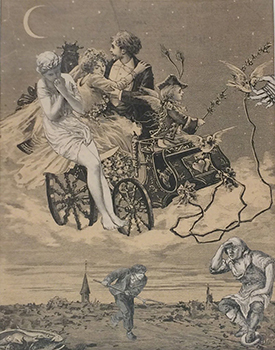 Their artworks expressed absurdity, nonsense, irrationality and socialist idealisms that were considered extreme leftist politically often expressing discontent with war, violence, and nationalism using unconventional materials in assemblage form with collages and photo-montage. Marcel Duchamp considered common manufactured goods as “readymade” works of art challenging norms of what art is or has become. New York, Zurich, Cologne and Paris were considered hubs of the movement. Abandoning academia-based techniques of chiaroscuro and foreshortening, cubism struck out to forge its own destiny in art history. The early analytic phase of cubism from 1908-1912 was a simpler form, using a wide range of mostly dark colors with overlapping layers creating a preconceived fusion of color. The artists would study objects and then break it up into different shapes arranging them into a variety of angles and viewpoints. This was done by showing many different aspects at once, using geometric shapes (cones, cylinders, spheres, polygons). The late synthetic phase of cubism from 1913-1921 was composed of simpler forms like the early phase, except with brighter colors. During the late 19th Century and early 20th Century, the French Empire’s expansion into Africa offered a fresh look for the European cultural elite. Pioneers and travelers were discovering African, Micronesian, and Native American Indian art and began bringing it back to Paris museums. Through these exhibitions, Parisian artists acquired an interest in Tahitian design, African art and tribal masks, giving rise to a more primitive approach to painting, thus attaining recognition in Paris’s avant-garde circles. The approach, like folk art, reduced complexity and focused on the basics of painting offering the most extreme approach against academia to date. A period when Mexican and Native American Indian culture influenced artists who visited and stayed for metaphysical elements among harsh landscapes that influenced daily life in the Southwest. Taos artists were mostly captivated by the indigenous people of the land and picturesque landscapes. A color-emphasized movement exaggerating colors to describe light and space, and redefined pure color and form as means of communicating the artist’s emotional state of mind. Color was the most important aspect of a fauvist painting, with the subject taking a backseat. Fauvism, which actually means “wild beast” as first titled by an art critic, in some ways grew out of the Impressionism movement. The 19th Century witnessed incredible technological and social advancements, spawned by the Industrial Revolution that brought on urbanization, territorial expansions, poor working and living conditions. Paris, at the time, was ground-zero for the art world in the 19th Century. During this period, patronage of the arts shifted increasingly towards the rich, wealthy and well-educated elite giving rise to the art dealers and critics. The French Academy and Salon represented the traditional establishment, favoring Neoclassicism at the beginning of the century and later Romanticism. Artists began to push back on this traditional Salon system in the latter half of 19th Century with the progression of Impressionism and Post-Impressionism, early modernism, and the avant-garde movements. Social and political commentary began appearing increasingly in paintings in their lust to change the path of artistic expression. This was also a period in which Japan began trading globally and began to influence style, technique and provided inspiration in European art. Art Nouveau is an elegantly decorative art style characterized by intricate patterns of curving lines used in architecture, paintings, and decorative arts. Art Nouveau was popular in Europe and the United States until World War I, and gave way to Art Deco. Pointillism is an art movement that uses tiny dots of primary colors to generate secondary colors focusing on the specific style of brushwork used to apply the paint. Growing from Divisionism’s focus on the color wheel, Pointillist art is considered to have been an influence on Fauvism and is often considered a form of Post-Impressionism. The Post-Impressionism art movement is a wide, encompassing term including many artists and a variety of techniques that were influenced by Impressionism but take a myriad of paths. While there is a specific Post-Impressionism art definition, it is generally considered more emotionally charged and less idyllic than most Impressionist artworks. Painting style of landscapes depicting soft light and shadows, often using a foggy or misty veil. With an emphasis on aesthetics, elegance, and harmony through the colors of a painting. Neo-Expressionism was the precursor to American Impressionism, Neo-Expressionism and was influential in photography of the early 20th Century. Impressionism uses a small, light brushstroke with spontaneity capturing a viewer oriented, idealism impression of light in a painting. This style of painting, like many other movements, arose from the disdain of conventional and restrictive painting techniques taught by academics. The art movement had faded towards the end of the 19th century, splintering into a variety of similar art movements regularly referred to as Post-Impressionism. The Impressionist art movement is largely considered the single most identifiable and influential painting movement and is still widely practiced. A period in 19th Century art that architectural-based with exaggerated sensitivity and manifestos of dark mysticism attracting a host of other focus forms including poets and even theatrical playwrights. It was a continuation of the Romantic tradition developing artistic approaches were more philosophical using mythology, astrology, and dream imagery as the visual language of the soul. It is believed to have colors with the Art Nouveau, Les Nabis, and Expressionists art movements. The earliest Realist art began to appear in the 18th Century, resulting from the excess of Romanticism and Neoclassicism. Realism’s approach to art depicts subjects as they are (or seen) without idealizing them, using false coloration, and without following rules of formal artistic theory. As artists became disenchanted by the artifices of art academia and salons, it gave rise to the most prominent Realist art era in the middle of the 19th Century. The French Realism, which came close to being an organized movement until it lost its political friction, eventually provided influence on the philosophy of the Impressionists art movement. The art of the Hudson River School melds two generations of American painter’s romantic images of America’s wilderness in the Hudson River Valley and in the undiscovered parts of the West. Sunsets and sunrises were often dramatized with light creating a natural, yet spiritual element to the mood, which subsequently became another technique called Luminism. The Barbizon School took its name from a village south of Paris near Fontainebleau Forest, called Barbizon. As an advancement against traditional art academia, the landscape painters worked to abandon theory to create a more accurate representation of life in the countryside and were considered part of the French Realist movement. dream-like, the art approaches were said to have given rise to the Impressionists and even Modernism with their focus on individualism. Romanticism emerged as a reaction against Neoclassicism. A time often associated with liberalism, radicalism, and more importantly nationalism. It did not really replace the Neoclassical style so much as it was a counterbalancing influence, and many artists were influenced by both art forms to a certain degree. Paintings during the 18th Century witnessed two influential periods known as the Enlightenment and French Revolution. Known as a light, elaborate and decorative style of art, the paintings of Neoclassicism were most popular in France and associated with the reign of King Louis XV (1715-1774) eventually giving rise to Romanticism. Neoclassical Art was a rigid reaction to the overblown Rococo style and the emotionally charged Baroque style. Neoclassical’s unemotional form of art was a style likened to that of ancient Greece and Rome. The rise of Neoclassical Art grew out of interest in the classical thought, which was of some importance in the American and French revolutions. The 17th Century saw expansions in global trade networks carrying with these networks an exchange of artistic objects, ideas, culture, aesthetics, and styles in Europe. Particularly in France, the country transitioned the consolidation of power under absolute monarchy, whose self-indulgence became visible in Louis XIV’s new royal palace in Versailles. Additionally, the French Royal Academy of Painting and Sculpture became established under the new monarchy. After 80 years of conflict, the Netherlands gained independence from Spain. A robust art market developed seeking town scapes, genre, portraits and still life from an affluent merchant class population. The great variety of artistic production in Europe in the 17th century is often loosely grouped under the Rococo and Baroque movements. The baroque style reflected the crisis of feudalism during a period of initial accumulation of capital and colonial expansion, as well as the growing contradictions in religious and social consciousness. The baroque architectural style was widely used in cathedrals during the Counter-Reformation and was distinguished by its magnificence. The exuberance of Baroque aesthetics combined with the fervor of the Catholic Counter-Reformation is evident in the re-constructed St. Peter’s Basilica in the Vatican. The penchant for Baroque art was not isolated to Europe, but also made it to the Americas, most notably in Mexico and Peru, as evidenced by ornate religious buildings. Developing out of Paris, France against symmetry and grandeur, it takes a wittier and graceful approach using ornate, asymmetrical designs, and curves with light colors, particularly gold. It grew out of the distaste of the previous Baroque style, especially of the Palace of Versailles, until it was redone. Courtship parties were often depicted in paintings of the Rococo Art movement. Baroque Art arose in Europe around 1600 against the intricate and formulaic Mannerism dominating the Late Renaissance. Characterized by a heightened sense of movement and lighting compositions, Baroque is less complex with easily interpreted details that produce drama, tension, exuberance, but more emotionally charged and realistic than its predecessor Mannerism. Baroque art was encouraged by the most important patron of the arts at that time, the Catholic Church, fostering a return to tradition and spirituality. A decision made by Catholic leaders at the Council of Trent, in response to the Protestant Reformation, exuded that the arts should communicate religious subjects with direct emotional involvement. 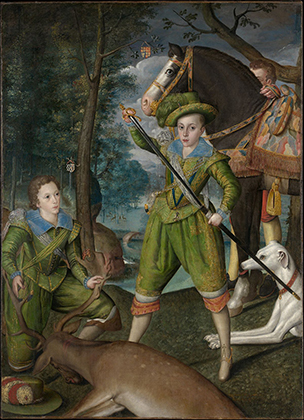 Aristocrats considered Baroque art and architecture as a means of projecting triumph, power, and control. The style began in Rome and spread to most of Europe. Following the Middle Ages came the Renaissance when Europe regained interest in the classical learning and values of ancient Greece and Rome. In addition to its expression of classical Greco-Roman traditions, Renaissance art provided insight into the individual beauty and mystery of the natural world. With it, came a new system of astronomy and the discovery and exploration of new continents followed by a flowering of philosophy, literature, political stability, prosperity, art and the printing press. The style of painting, sculpture and decorative arts identified with the Renaissance emerged in Italy in the late 14th Century reaching its height in the late 15th Century and early 16th Century. Mannerism art, is noted for intellectual sophistication and its unnatural qualities encompassing a variety of approaches favoring tension and over balance and clarity of earlier Renaissance painting. Mannerism exaggerates proportion, balance, and ideal beauty, often resulting in compositions that are asymmetrical or unnaturally elegant. Considered a late transition of the Renaissance period into the Mannerism style, paintings included the Northern European Gothic tradition while combining a more modern human approach provided by modern achievements in science. With an expansive resurgence of knowledge of philosophy, literature science, and contemporary advances, these themes became more evident, but with a classical antiquity with formal restraints overseen and judged by the church. These centuries were primarily controlled by the Proto renaissance movement, denoting art from northern Italy largely from 1280-1400. A form that wasn’t quite Gothic or Romanesque, but is considered the primary influence of the Renaissance period. Painting subjects were largely religious and often included halos around the heads of figures.